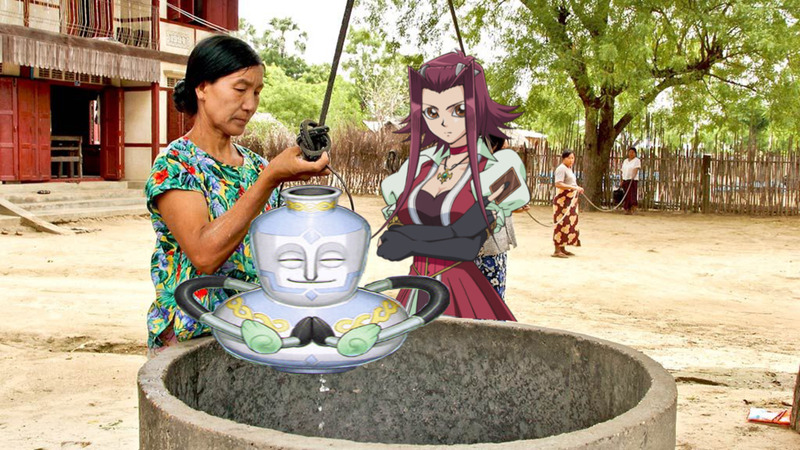 Don't ask why Akiza isn't helping her elder draw a bloated Pot of Benevolence from a well, ask WHY is this elderly woman pulling a bloated Pot of Benevolence from a well. Pot of Greed, One Day of Peace, Pot of Avarice, and Card Destruction. What three things do these cards have in common, other than them being Spell cards? They are all banned or limited, they allow one to draw from the deck, and they show just how serious the makers of the Yu-Gi-Oh TCG are about limiting your options to quickly vanquish your opponent. If draw cards were a guest at a party, they would be that charismatic guy or gal who draws all the attention (Ha…) by being funny, interesting, and charismatic, yet nobody really wants them there because they take all the attention away from us sad, dull-faced normies. But we’re not here to talk about draw cards. The here-today-banned-tomorrow relationship they have with the game makes them less reliable than that family member you always try to borrow money from who is always broke, despite them living in a three-story house behind a gated community. We’re here to talk about draw engines, the equivalent of borrowing a small amount from several different friends as opposed to always hitting up that single, “broke” baller ;). In Yu-Gi-Oh terms, a draw engine incorporates a pool of cards from another archetype that enables one to add cards to the hand to reach the key cards of an overall theme. In simpler terms, it’s when one takes a group of cards from another deck to enable one to draw from the deck one actually wants to run. Set in no particular order, these are, in the writer’s opinion, the best 10 draw engines currently in Yu-Gi-Oh. Why Effective: The Bamboo Engine appears simple at first glance, but a little depth into the card’s members reveals weapons made from the panda’s exclusive choice of diet have great flexibility. 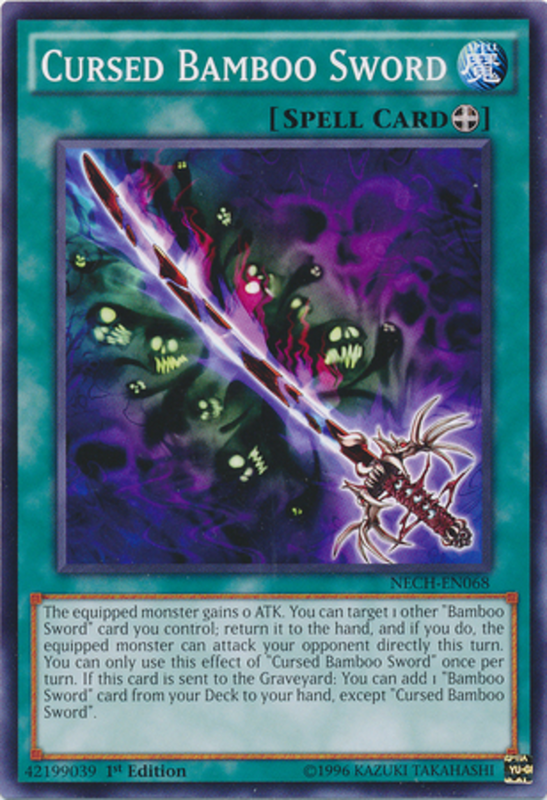 Sending Cursed Bamboo Sword to the Graveyard allows one to search for any other member of the card’s group, and one can even create a Draw/Main Phase 1 lock if including the Soul Devouring and Burning Bamboo Sword in their lineup. To add spice and pepperoni to the pie, Fairy Tail – Rella can speed up the engine by searching for the Equip Spell cards needed to activate Golden Bamboo Sword. With all these benefits, the writer might consider adding some bamboo to his diet as well. 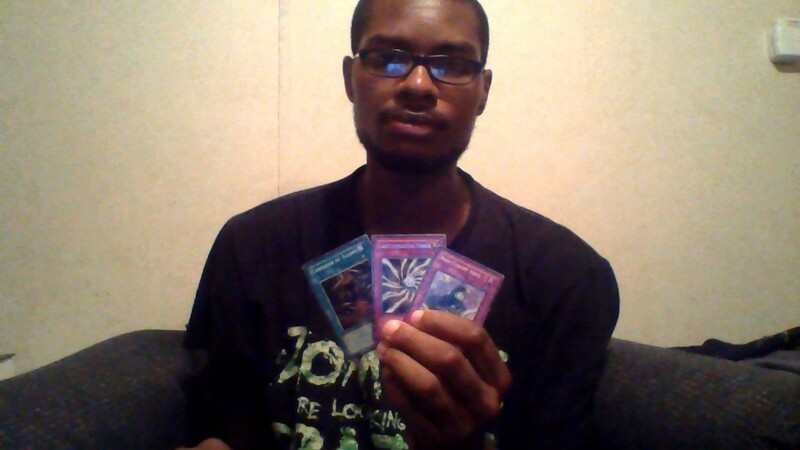 Activate Spellbook of Knowledge. Send the Magician of Prophecy to the Graveyard to draw 2 cards. Why Effective: A two card combo to draw two cards from one deck, and one of the cards searches for the other… need the writer say more? 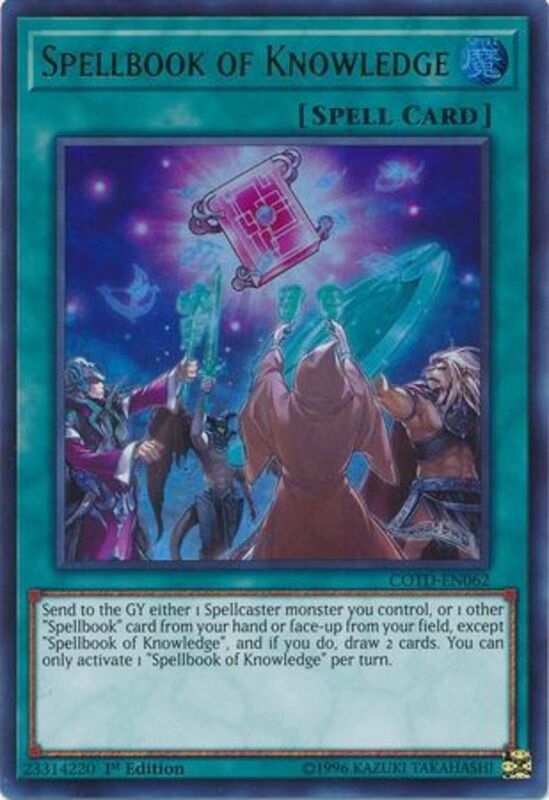 Perhaps he will, for this combination creates further deck thinning if one wants to search for Spellbook of Secrets first, and then use that card’s effect to hunt for Spellbook of Knowledge. Adding this engine in a Spellcaster deck makes it even more reliable. So reliable, in fact, one could say it works like magic. Activate Solar Recharge by discarding a Lightsworn monster to draw 2 cards and send 2 cards from your Deck to the Graveyard. Why Effective: If you’ve viewed the writer’s subjectively objective Spell card hub, you’ll know he thinks Solar Recharge is the best themed draw card in the game. The card not only allows one to draw two cards (at the price of a Lightsworn, of course), but also thins the deck, advancing one’s strategy if one needs cards in the Graveyard. The engine can buff any deck, but produces greater results when mixed with something working around the Graveyard, like Zombies, Burning Abyss, or Shaddolls. Whatever your preference in poisonous concoction, considering their access to the Synchro Michael and the versatile Xyz Minerva, a Lightsworn Draw Engine should never disappoint. So, we have a sorceress, a paladin, a nun, a scribe, the pet dog, the Link that’s the Pope, and… a neko archer? One of these things doesn’t belong with the others. Activate Performapal Lizardraw in your other Pendulum Zone. Use Guitartle’s effect to draw a card. Activate Lizardraw’s effect to destroy itself to draw a card. Activate Electrum’s effect to draw when a card in your Pendulum Zone leaves the field. 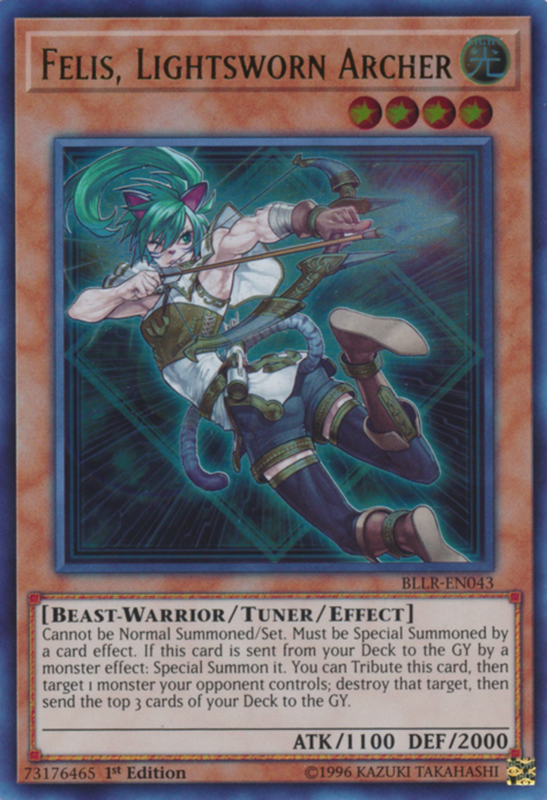 Why Effective: Even though the circus animal troupe was greatly hindered by the Link mechanic (Yes, you’ll hear me saying that a lot in these articles), and then they were hindered further when all their boss monsters decided to band together and form their own archetype (The rainbow of Odd-Eyes cards. Still waiting for that cyber version), the Performapals still have an effective draw engine reinforced by the only Metalfoe who enjoys heavy metal. Easily drawing three cards per turn, granted you have the three cards needed for the combo, is nothing to turn one’s nose up at, and Lizardraw and Guitartle both being Pendulum monsters and able to abuse their “So-what-you-killed-me-last-turn” ability makes the Performapal engine still liable for increasing hand advantage. Man, this guy’s a great draw card for Pendulum decks, period. 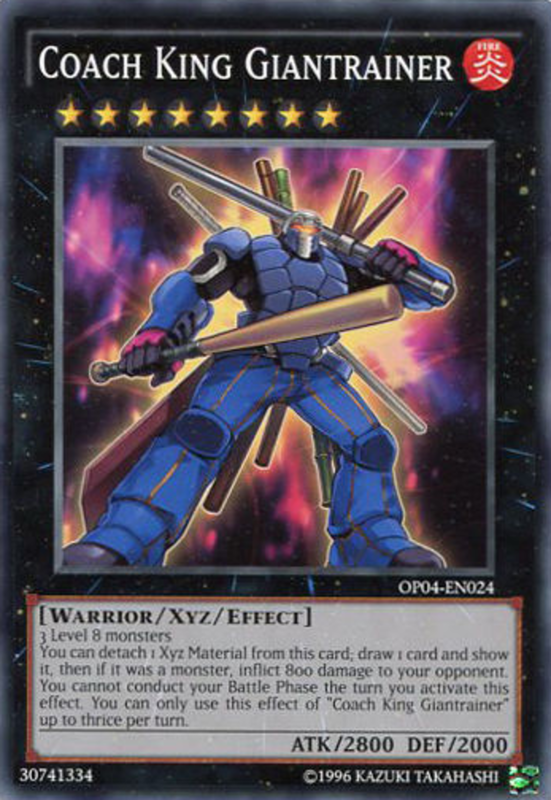 Until everyone screams in ecstasy when Crystron Needlefiber hits the TCG, when can we get that Xyz-support Link, Konami? Huh? If necessary, discard Snoww by card effect to add any piece of the combo missing to your hand. Play Dark World Dealings and draw a card, then discard Broww for its second effect. Activate Broww’s effect to draw another card. Play The Gates of Dark World. Banish a Fiend monster from your Graveyard then discard a Fiend (preferably a Broww to draw again, or Snoww to grab another Broww or Dark World Dealings) to draw a card. Why Effective: Other draw engines need their cards to work in tandem with other members in its groups to produce results, but everyone’s favorite pissed garbage patch kids don’t abide by such restrictions. Any card discarding by card effect can trigger the effects of Snoww and Broww, and a Fiend in the Graveyard and in the Hand is all one needs to use The Gates of Dark World. Heck, you could play Dark World Dealings without a Broww or Snoww in one’s hand to draw a card. The true terror comes when combining these three cards together for some interesting draw combos, but the fact that each of these small dogs, deals, and... gates… are strong enough to stand alone makes them craft one of the most versatile draw engines in the game. 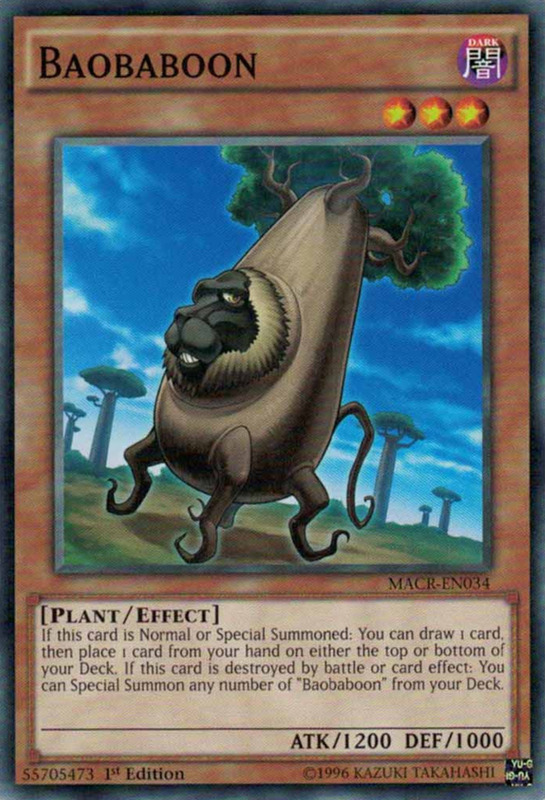 Special Summon a Baobaboon from your deck. Activate its effect to draw a card, then place a card from your Hand on either the bottom or top of your deck. Destroy Baobaboon either by ramming it against your opponent’s monster, waiting for your opponent to destroy it (Not recommended) or destroying it yourself via card effect. Special Summon your remaining Baobaboons from your deck to draw two more cards. Why Effective: This horrific fusion of plant and animal from Dr. Moiré’s laboratory assists its player when one grants its one, most deeply desired wish: To be put out of its sad, sad misery. It’s even so happy it found a duelist with the gall to do what others couldn’t, it gladly tells its friends of your violent “mercy,” beckoning them to grace the field to experience the same, sweet salvation of release from their torturous, corporeal existence. 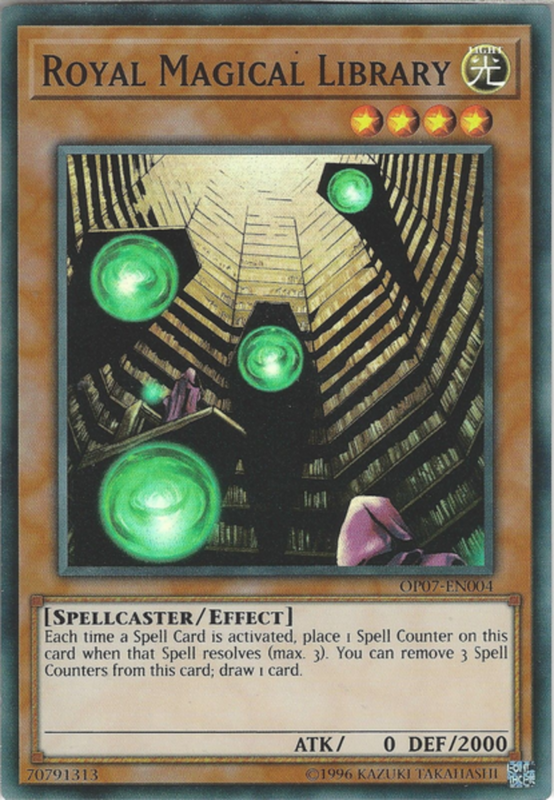 If you’re a cruel duelist, you can even make them repeat their former hell by returning them to the deck (Jar of Avarice, Exodius the Ultimate Forbidden One, etc) to begin the cycle anew. So, grant mercy to your Baobaboon. Destroy them, and your blessings will be returned back to you. The Baobaboon… It’s either the product of a supreme rise of creativity or a severe descent into madness. Link summon into Knightmare Unicorn as quickly as possible. 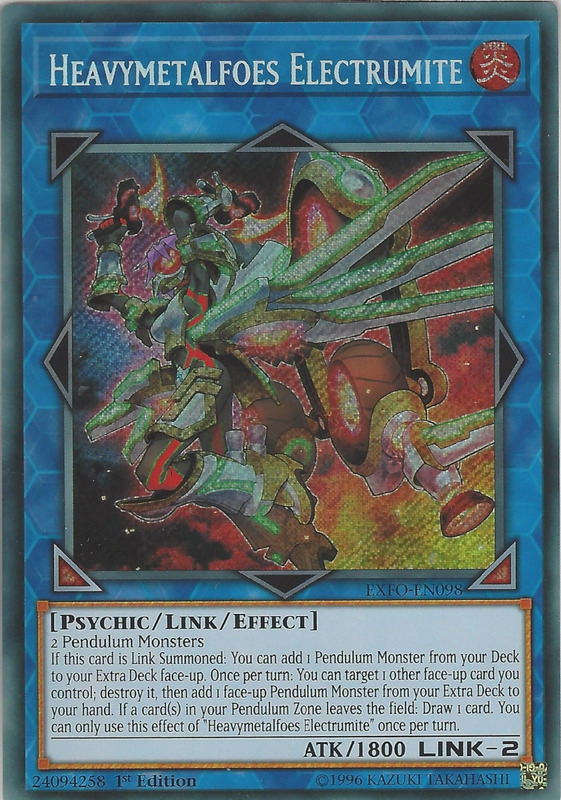 Link Summon Knightmare Phoenix or Cerberus to co-link with Unicorn. Discard 1 card to either destroy a Spell or Trap or a Monster (depending on whom you summon) and to draw for being co-linked with Unicorn. Link Summon either Knightmare Goblin (recommended) or another Knightmare monster, making sure it’s co-linked to discard and draw again. During your Draw Phase, draw 1 card extra for every Knightmare monster with a different name co-linked thanks to Unicorn’s effect. Why Effective: Ahhhh, Link Monsters. If Yugioh Arc-V ever had a sequel, he knows the Standard Dimension would flip its “play for fun” morals and declare utter annihilation on the Link Dimension. The Knightmare rub their dark blue tails in everyone’s faces further by not only creating an effective draw engine when co-linked, but by also granting each other immunity. Nightmare Goblin ends targeting, the Cerberus halts card effect destruction, and the Phoenix grants a shield to battle death. Most draw engines just enable one to go through one’s deck like an athlete obsessed with obtaining the most jacked wrist ever, but the Knightmares form a threat themselves when forming an unholy prayer circle, making them a potent, modern draw engine to consider. Oh, and the writer can see some of you sharpening your wits now, so he’d like to declare he didn’t include Knightmare Corruptor Iblee and Gryphon on purpose. This is a draw engine, not a deck for the dark horse girl and her army of the apocalypse ponies. Summon two Beast-Warrior monsters using the best method appropriate for your deck. Summon Coach Captain Bearman. Use his effect to make all your face-up level 4 Beast-Warrior monsters level 8. Xyz Summon Coach King Giantrainer using three Beast-Warriors, including Bearman, as material. Detach a material to activate his effect to draw a card. If it’s a monster you draw, burn your opponent for 800 damage. Repeat the effect two more times to draw two more cards. Why effective: The writer doesn’t know what type of relationship the card game makers have with Beast-Warrior monsters, and he guesses it doesn’t matter. Whatever the details of their “intimacies,” they’ve produced some of the best Beast-Warrior decks we’ve seen in the past few years, and Coach King Giantrainer Engine is one of the offspring of their Tigermortar body-pillows Trident pin-up posters. Your deck may have to be Beast-Warrior laced to run the card, but with so many effective options available (Lunalight, Fire Kings, Fire Fists, and Zoodiacs, to name a few), adding a card that gains access to a 2800 beater enabling one to draw three times might make you want to invest in some Beast-Warrior paraphernalia too. I see Casey Jones’s master is in top form today. Summon a Royal Magical Library. Activate Magical Citadel of Edymion. Every time you activate a Spell Card, the Royal Magical Library and the Magical Citadel of Endymion will get a counter. Remove three counters from the Royal Magical Library to draw a card. If you run out of counters on your Library, then once per turn you can remove counters from the Citadel for the Library’s effect. When you use counters from the Citadel for Library, immediately play another Citadel so you can use its effect again once it has acquired more spell counters. 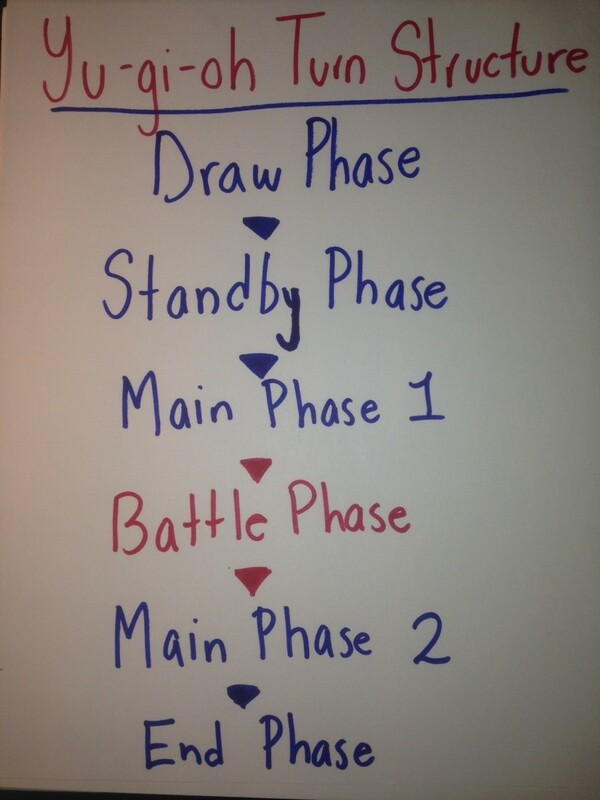 Why effective: It’s an oldie, but still a goodie if you need a specific arrangement of cards for a win condition. The best news about this draw engine: it’s the only one on this list capable of letting you draw your entire deck in one turn. The worst news about this draw engine: it’s very fragile and lacks consistency, a bad opening hand capable of making one lose the game (Sans Library, sans victory). However, a draw engine such a beast it can draw you to victory in a single turn (Exodia… duh) might just need a little more tweaking before it comes under the laser vision of the Ban-Watch. Man, this card would be broken in Mystical Beasts. Fortunately we're in the deceased girl and Infinite Transience age of staples. Seriously though, what’s with Konami’s obsession with zombie children? Have a White Stone of Legend, Cards of Consonance, and Trade-In in your hand. Activate Cards of Consonance by discarding a White Stone of Legend (WSoL) to draw two cards. Use the effect of WSoL to get a Blue-Eyes White Dragon to your hand. 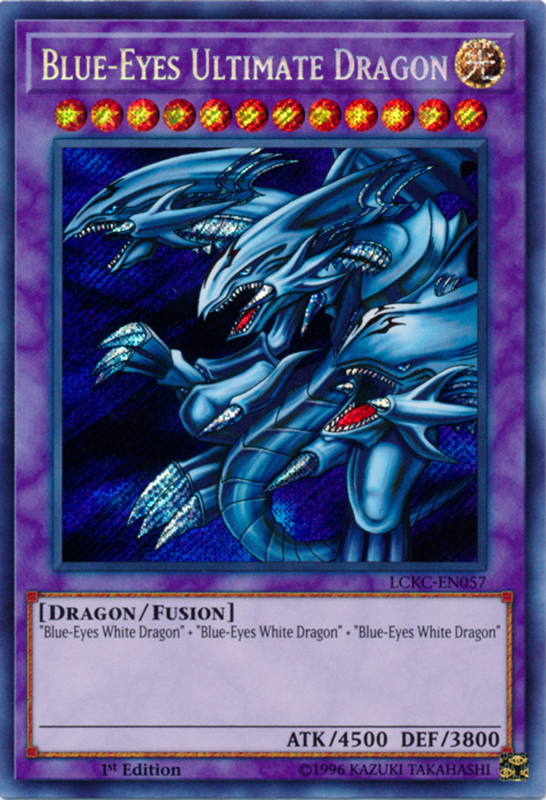 Activate Trade-In by discarding Blue-Eyes White Dragon to draw two cards from your deck. If necessary, send The White Stone of Ancients (WSoA) to the Graveyard to Special Summon a Blue Eyes from your deck. During your Endphase, add the Blue-Eyes you discarded to the Graveyard back to your hand to discard for another Trade-In later. Why Effective: Let’s see… A draw engine built around a normal monster with 3000 attack consisting of two draw cards not restricted by “Once per turn” restrictions… The writer doesn’t have to say more, but he will. The surprising versatility in a draw engine named after one monster is the amount of Normal and Dragon support one can splash in it. The albino-eye-dyed-blue dragon using normal support, as well as the plethora of Blue-Eyes support, will ensure you have a myriad of ways to build around your draw engine. The engine may be heavy with Eyes of Blue, but it’s still effective at thinning your deck to your hand. Introducing the The Toughest! The Invinclble! The Unbeatable… Hey! 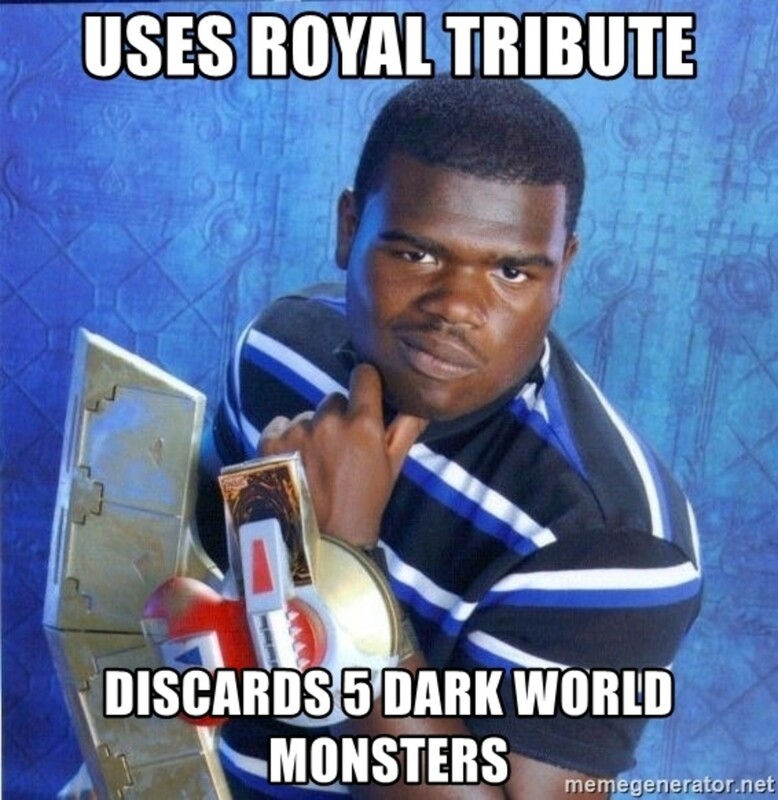 You’re laughing now, but give it another booster set or two. What Draw Engine Outperforms the Others? The bamboo... that's half tree? I just can't do this sometimes.